I recently got married, and as is customary organised a dive trip honeymoon to relax in the aftermath. I will spare you the romance and the details of our visits to Havana and Trinidad (the city in Central Cuba, not the country) as you can find plenty of information about those places elsewhere (and if I do write it up I will add a link later). What follows is a summary of the diving part of my our Cuban honeymoon. Going on honeymoon with your (as-yet) non-diving wife and taking your dive kit with you may sound like a recipe for a quickie divorce. However, I am a lucky man with an understanding partner. We often snorkel together and she loves it when I point out creatures she would otherwise have missed. But I haven’t managed to lure her any deeper than the bottom of the pool in scuba gear. She claims she will learn this year – as a wedding present (!) – although because of how much we were due to move around it seemed unlikely to happen on this trip. So, our itinerary was somewhat tailored to allow for diving, rather than being governed by it. So, I could do some diving. Four days out of 14, plus a day snorkelling. I’ll take that. Here is what I managed to get away with. When I asked diving friends to recommend a Cuban shore diving location that would also be a good place for a non-diver to visit, most people said ‘the Bay of Pigs’. This area was made famous in 1961 when a CIA-backed militia invaded here with the aim of overthrowing the communist government. They failed, and there are big commemorative signs reading e.g. ‘First great defeat of Yankee imperialism in Latin America’. In a modern, air-conditioned, fully-functional taxi it’s just a couple of hours south of Havana. I’m not generally a fan of big hotel resort-style locations, so the casa particular (bed-and-breakfast) accommodation which dominates this area appealed to me. We stayed in Playa Giron, which is at the most easterly point of the bay. From here you are about half-way between two of the main attractions in the area: Cueva de los Peces (Cave of the Fishes) and Caleta Buena – both good snorkelling spots which we would have liked to have visited given more time. Having been picked up by the dive bus right outside our accommodation at 8 am we were taken to the dive centre at Hotel Playa Giron. After signing our lives away, being asked ‘are you advanced?’ and acquiring any kit we needed, we were boarding the bus again and on our way to the dive site. Between Playa Giron and Playa Larga there is a roadside restaurant, behind which is one of the most dived and snorkelled spots in the area. We drove right in and stopped beside several shaded sun loungers. This is where we would kit up, just a few metres from the shore. The entrance we used was a platform about 2m above sea level into water also about 2m deep. My fins hit the sandy bottom, which is not ideal, but there was no harm done to me, or to any marine life as far as I could tell. Divers leaving the shore are accompanied through the shallows by yellow-tail snappers. This behaviour is apparently caused by divers and snorkelers sometimes feeding them. A shallow swim via various scattered coral formations leads you out to a coral garden. This, in turn, drops off to a wall about 100m from shore, starting at about 10m. It drops off deeper but we only went to about 25m. 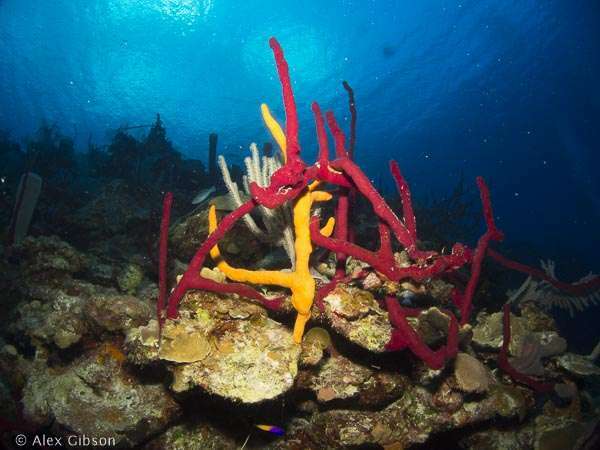 Hard coral and sponges dominate. Purple sea fans move with the waves. There are twisted red, yellow, green and purple formations – shine a torch or flash a camera and there is plenty of colour to enjoy. Dive guide pace is not usually great for underwater photography, and despite ours, Julio, having a camera himself that was as true as ever here. I get the feeling it is an unspoken commitment to giving people their money’s worth – seeing the highlights – but given the opportunity, I would choose quality over quantity. There was a fair amount of fish life – snappers, angelfish, barracuda, moray eels – but little opportunity to stop and compose decent photos of much of it. This was a fun introduction to Cuban diving but I would have preferred to have gone slower or perhaps even unguided. The pre-dive brief was ‘first dive we go left’ and ‘second dive we go right’, so I think it wouldn’t have been too hard! This is a very relaxed place to go diving, some might say too relaxed. If I had been sticking around any longer I would have asked more questions about the conditions, proposed dive route, planned profile, gas management and marine life. In the next part – snorkelling in the Bay of Pigs. Alex Gibson is a UK-based diving instructor and keen underwater photographer. He can usually be found diving the south coast of England, particularly in Dorset. He is Editor-in-Chief of Dived Up Publications.